Welcome to Porcupine Castle in the heart of Coorg, a Unique Getaway amidst the sounds of nature and plantation of the brewing berries. 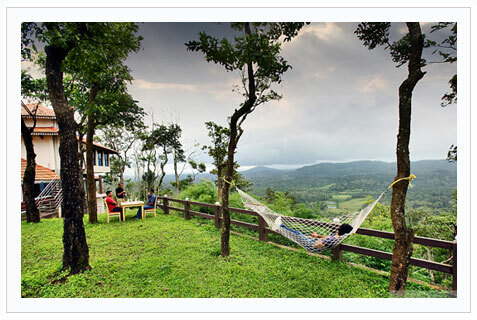 Nestled on top of a picturesque hill with panoramic views across the vast expanse of the Coorg valley. A pleasant two hours drive from Mysore and 10 minutes drive from Pollibetta, it offers independent cottages with comfortable rooms and magnificent views from each cottage. An ideal venue for a relaxing and refreshing break for couples, families and small groups. This is a nature lover’s haven with walking tracks through the adjoining estates of the Thattarkunnel family and easy access to Nagarhole National Park, Tala Cauvery, Tibetan Settlement at Bylukuppe and many other attractions close by. 12 % Tax applicable on the qbove mentioned tariff. Tariff is for a couple and children below 5 years of age. Check in 12 Noon/ Check out 11 am. Tariff includes accommodation and all meals,. Children who are between 5 to 10 years would be charged Rs. 1500 per day + Tax. Same tariff is valid for foreign nationals also. Cancellation or refund or change of dates as per hotel rules. Resort can also offer packages on room only basis, room with breakfast, room/ breakfast/ one major meal basis. Call us for more details on those packages. Porcupine Castle is conveniently located between Pollibetta and Ammathy in South Coorg (10 minutes drive from both towns). Once you reach Hanchikad Village, follow the signs to the resort.